“Patchwork Postcards and Pinboard Quilts” book review, discount code and Giveaway! 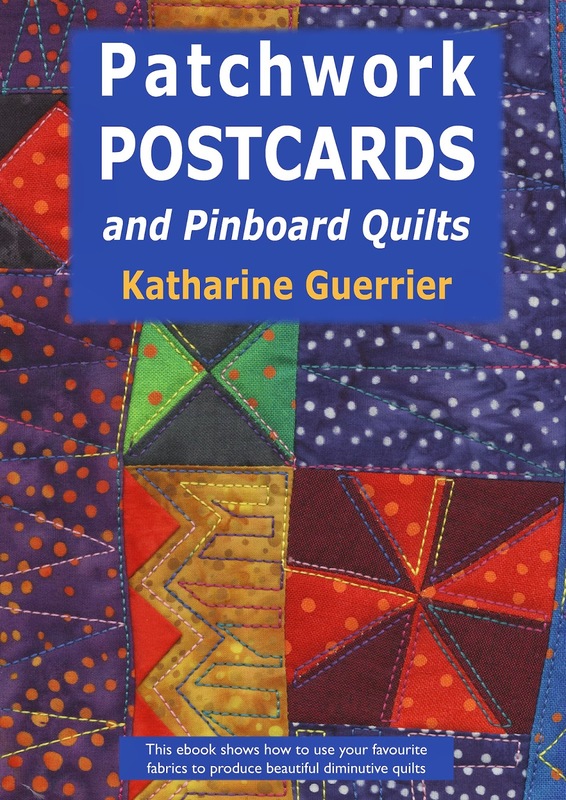 I have been have a pleasant read of this ebook from Vivebooks called “Patchwork Postcards and Pinboard Quilts” by Katharine Guerrier. This book is full of great ideas for using up your small fabric scraps, that are too precious to throw away, to make fantastic little mini quilts. I always feel like I’m throwing money in the garbage when I throw out my little scraps so this is a great alternative. The ideas in this book lend themselves well to using any style of fabrics. I can just see some of them made up with my Cotton + Steel scraps and my Kona solids. There is also instruction on Seminole piecing which is a technique that has been around for a long time in quilting but still looks really great today and could be done using some of our fresh modern fabrics that we have available to us. There are no patterns but there are excellent instructions on different artistic styles to get you going on improvising your own postcard and pinboard quilts. Some of the topics include; balancing colours, repetition of a shape, African, Provencal and Amish styles. There are some really cool ones in here with tiny little prairie points in the seam. I really like the “Bright Colours with Black” section and could see those as mini quilts travelling the world in swaps. There are even ideas for using other fibre scraps and embroidery on your postcard quilts. The ebook includes complete construction and finishing instructions for your quilts as well as ideas for displaying them. It is full fabulous inspiration. The back cover of the ebook tells me that Katharine Guerrier is an acclaimed quilter, teacher and author who has written many books and trained at Camberwell school of Art in London. She has been making quilts and embroideries since 1980. As I often find with many quilting books they are fantastic inspiration for jump starting your own ideas for projects and this book is no exception. Vivebooks has generously sent me a copy of “Patchwork Postcards and Pinboard Quilts” on CD to give away to one of my lucky blog readers. They are also offering a discount of 10% using discount code: daydreamspatch This discount is valid until Sunday December 14th, 2014 and will expire after that date. To get the discount, type the discount code in the box on the basket page of their website and then click Apply Coupon. This code cannot be combined with any other offer. See the bottom of this post after my snowflake postcards for the giveaway. The theme of the postcard swap is Snowflakes. I used scraps of my Swedish Linen (which I would never throw away!) to make the snowflakes. I used Aurifil thread and decorative stitches on my sewing machine and then appliqued them onto my background which has a stiff fusible material on the back to give the postcard enough strength to withstand the mail system. A close-up of one of my snowflakes. I used a blanket stitch to reinforce the edges and keep frayed pieces from catching on the postal sorting equipment. Here is the back. I bought a little kit from My Sweet Prairie on Etsy for the fusible and the stamped backing fabric. Please use the rafflecopter to enter the “Patchwork Postcards and Pinboard Quilts” giveaway. This giveaway is open Worldwide and will close on December 10th at midnight MST. The winner will be emailed and announced on my blog and my Facebook page. Disclosure: This giveaway is sponsored by Vivebooks. This post contains affiliate links. I received a free copy of the “Patchwork Postcards and Pinboard Quilts” ebook in order to write my review. My thoughts and opinions written here are my own and have not been influenced in any way. Looks like a great book! Are you thinking of starting a swap?? Glad you liked this one Anita. It's one of my favourites – like a mini course on quilt composition! I love your postcards! We have a quilting lady in our group who makes fabulous postcards, and I have always wondered how she does it with such small pieces of fabric. She often goes around as we sew and collects bits and pieces, and then the following Christmas, there it is! A completely lovely postcard featuring all of the fabrics you had used that year!! Marvelous!! Another great Vivebooks Ebook!!! Previous PostPrevious IG Mini Quilt – The Great Reveal!